From this short introduction, it is obvious the Sultan is not so much concerned about the fate of Muslims in general and particularly those in Yorubaland for the simple reason that he did not deem it fit to condemn Fulani herdsmen atrocities in Yorubaland, with recorded cases of such terrorism visited on hapless villagers and farmers who also end up being prosecuted and persecuted by the police acting on behalf of the Nigerian State. There are Yoruba Muslims among these victims. 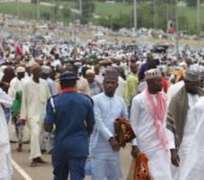 For the Sultan, however, their being Muslim is of no consequence as they are not Fulani. The Sultan has now deemed it fit to speak out in support of the “Hijab” controversy as a religious issue; while the President resorted to the usual demand on the security forces to fish out terrorists and criminals anchored on what we had always been treated to as excuses on these atrocities; ranging from cultural economy of cattle rearing to cross-border criminal gangs to ECOWAS treaty on freedom of movement for herdsmen without challenging the Nigerian State to live up to its responsibilities as to the security of her citizens. What these represent is the fact that the problems of Nigeria, Hijab or no Hijab, is not of a religious nature but political, an aspect of the consolidation of the post-colonial State with the aim of homogenizing the various Peoples into a uniform identity, aided by the colonial military also heavily dominated by the Fulani. This is more-so when Fulani leadership line up behind their own people to the detriment of other Peoples, Muslim or not. This is reminiscent of the Solagberu saga at the time of the Alaafin versus Afonja conflict in the Oyo Empire where the battle for the soul of the land transcended religious affiliation as Solagberu, a Yoruba Muslim had come to his non-Muslim friend Afonja’s aid when the latter was faced with an internal rebellion of his erstwhile Fulani Muslim allies. For Yoruba People, religious tolerance is a major aspect of Yoruba National culture and as an example of societal harmony with members of the same family practicing different faiths without disruptions in family relations. This reflects a material reality, to wit, the Yoruba, of whatever religious persuasion, had, and has the Yoruba Cosmogony as the unifier, defining our existence and therefore identity, as the first line of engagement, which allowed the Yoruba to “overcome” the barriers that would necessarily have accompanied their being pulled in antagonistic directions of religious doctrines. This was the experience during the pre and post-Independence periods where Yoruba Muslims were not found wanting in the defense, development and promotion of the Yoruba Nation as exemplified by the likes of Saburi Biobaku who headed the Yoruba Historical Society which later became the Ibadan School of History, Aliyu Fafunwa with his Ife Model School where students were taught in their mother tongue(Yoruba), Dauda Adegebenro who stood up to the antics of the Fulani/Igbo Alliance in their attempt to neutralize the AG leadership, Alhaji W Elias, a close friend of Awo who stood solidly by him throughout his travails and of course, S.O Gbadamosi, one of the intellectual and ideological pillars of economic development of the Western Region, Lateef Jakande the “Action Governor” of Lagos who had also proved his mettle and fidelity to the Yoruba throughout the treasonable felony period, Ganiyu Dawodu who was able to maintain Lagos for the Action Group when the Party was under severe threat and stress, Adegoke Adelabu who provided credible opposition in the Western Region not to mention Layi Balogun and Suliat Adedeji, of the NADECO fame, both of whom lost their lives in defense of the Yoruba against the Abacha military regime not to forget Bisi Akande and Bola Ahmed Tinubu whose anti-thesis to the military’s attempt at atomizing Yorubaland is Yoruba political solidification which has become the Yoruba ace in the on-going quest to remake Nigeria. These are just a few among those Yoruba Muslims not found wanting in promoting the good of Yorubaland. Recognizing the above proves that the pursuit of the good of the society or its negation may be propelled by the individual’s fidelity to his or her faith or the utmost lack of it; but the faith itself is not the issue. What then constitutes this “good” for the Yoruba? This is more so when the State is assumed as being saddled with the task of providing the greatest good to the greatest number of its citizens where, historically, Yoruba society, existentially, had tended towards the “good”, sometimes resulting in internal convulsions as manifestations of this process. This was also the Yoruba experience in the anti-colonial struggles where the pursuit of the “good” resulted in what is now regarded as the Golden Era of Yoruba development, in which, as noted above, Yoruba Muslims played a prominent part. This “good” was pursued despite the “Balkanization” of the Peoples of Africa; the reversal of this “Balkanization” is at the core of the Restructuring wave blowing in Nigeria and which, by the way, enabled the Sultan to declare himself rightfully as the Fulani leader in Nigeria and West Africa. Yet other Nationalities in Nigeria are not expected to consider themselves as part of a larger Nation across West Africa. But having done so, and with Yoruba Muslims under his authority, it is incumbent on Yoruba Muslims to pause and decide whether they are for the “good” of Yorubaland as their predecessors were or remain nonchalant about their Yoruba Nationality while promoting their religious affiliation as the ultimate. Making this choice will allow them to contextualize any and or all their demands. If this choice can be made for them, as it appears is being done, it will pit them against their Nationality, becoming part of the largely “foreign” forces aimed at subjugating the Yoruba Nation while consolidating their own inside and outside Nigeria, merely utilizing their faith/religion as part of a larger political methodology and with the active connivance of the Nigerian post-colonial State, already weighted heavily in their favor.